Tell me if this ever happened to you guys too… You walk into Topshop, whose windows are adorned with giant photos of Cara Delvigne looking majorly rad in their latest style. Of course you’re super excited to get that outfit she’s wearing (I mean who doesn’t want to look like Cara). Then fast forward a half-hour later at the dressing room and you’re thinking: what the what, this dress is actually super unflattering on a regular person (and you look nothing like Cara at all). Well maybe it’s because I’m almost a full foot shorter than her, but still! Since that’s my experience most times I go to Topshop I always get super giddy excited when I find things that fit me really well, like this judo wrap jumpsuit. Not only does it fit great and makes my booty look good, I don’t even have to alter the pant legs (a rarity for a 4’11” shorty like myself). I may not be the splitting image of Cara, but I sure do feel as good as she looks. Outfit Combo: judo wrap jumpsuit from Topshop, clemence minaudiere clutch from Pour La Victoire, pumps from Christian Louboutin (find similar here), spiked out necklace from Slate (find similar here), naomi double ring from Kendra Scott,. I love this look! I love that it would work for a shorter lady like myself too!! 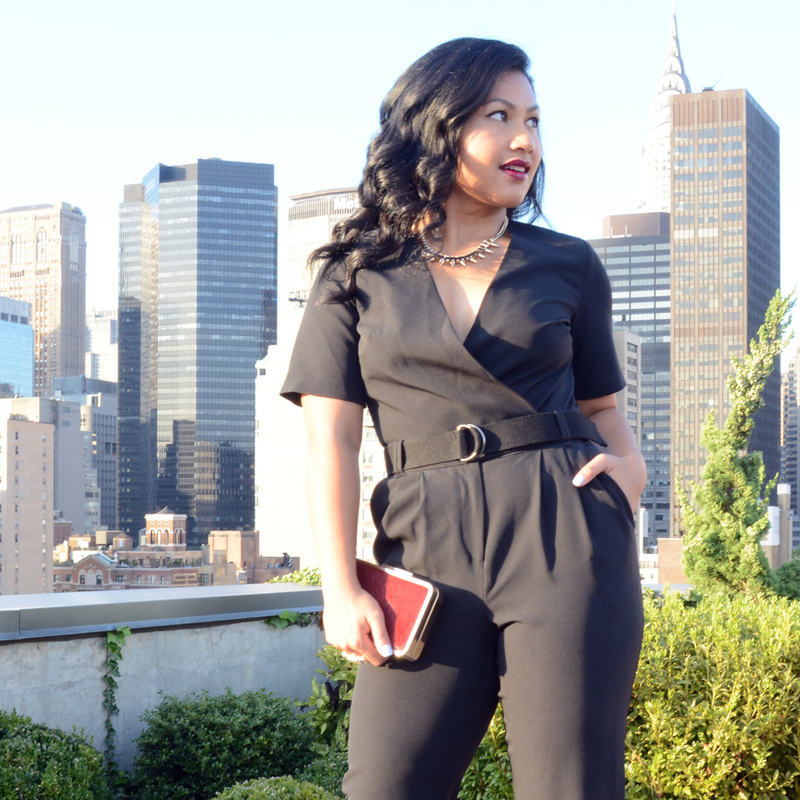 You’re totally rocking this jumpsuit, babe! I love it! Im loving this black jumpsuit, nice handbag, btw. You are looking cool below fresh blue sky. SO chic! I would love to send you a piece from our new collection! This is something out of comfort zone but worth trying.